After arriving at LaGuardia, we took the subway to the hotel. I looked at traffic vs the subway, and it was basically the same, so we went the public transit route. You have to take a bus and then a subway train to get to downtown Manhattan from LaGuardia. I could see it would be difficult to figure out for someone unfamiliar with how public transit works. One thing I did figure out – if you do a prepaid MTA card, you can use it for up to four people, including the airport transfer. All that being said, it amazes me that the biggest city in the US does not have easier connections to the airports. When we walked in, the porter offered to take our bags up to the room. You have to take an elevator up to the lobby and dining floor upon entering. We arrived a bit before check-in time, but a room was available for us on the 11th floor. 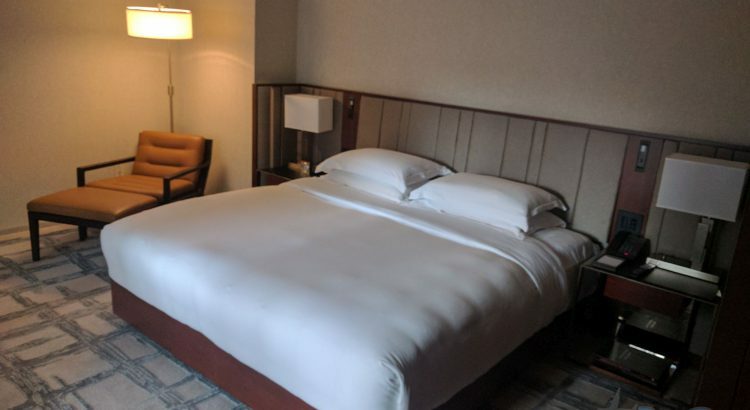 I have Explorist status with Hyatt, but there was no mention of the status nor did I receive any upgrade other than being told our room was the largest Park King room. There were also no additional perks in the room outside of 2 pears in a bowl that looked to be a standard feature of the room. The room was absolutely gorgeous and very spacious. We were in a Park King room on the 11th floor. Starting in the hallway, there was a really cool trunk that opened up with the safe and some drawers. Also in the entry hallway were one closet with drawers, another closet for longer clothes, and the minibar. Moving on to the bedroom, there was a large desk, TV, and an extremely comfortable bed. Outlets were well placed by the bed. There were also A/V connections for the TV by the desk which is always appreciated. It frustrates me when hotels that lock down the TVs and make it impossible to connect external devices or change inputs. The only thing that was really lacking about the room was the view which was of the side/top of the neighboring building. The bathroom was extremely modern and well-appointed. The toilet and shower were in separate rooms. The shower had both a handle and a powerful rain-shower head. There was also a very large, modern tub. There were also a few smaller things that really made the bathroom fantastic. Namely, the floor was heated and there was a TV in the mirror. Samantha informed me that the mirror TV would be necessary in future houses/renovations. We walked around the rest of the hotel to see some of the other features. Up on the 25th floor, there was the pool, fitness center, and spa. The pool was a lap pool with comfortable recliners. It also has a lifeguard while it is open which seemed unnecessary. Maybe it is a law in New York City. The fitness center was well-appointed with modern machines and free weights. We did not go into the bar or restaurant so I cannot comment on those. The hotel definitely exceeded expectations. I really liked the overall style of being modern but understated at the same time. The location also cannot be beat with easy access to the subway and walking distance to Times Square. The only complaint would be the lack of status recognition, but I was not expecting anything in this regard.